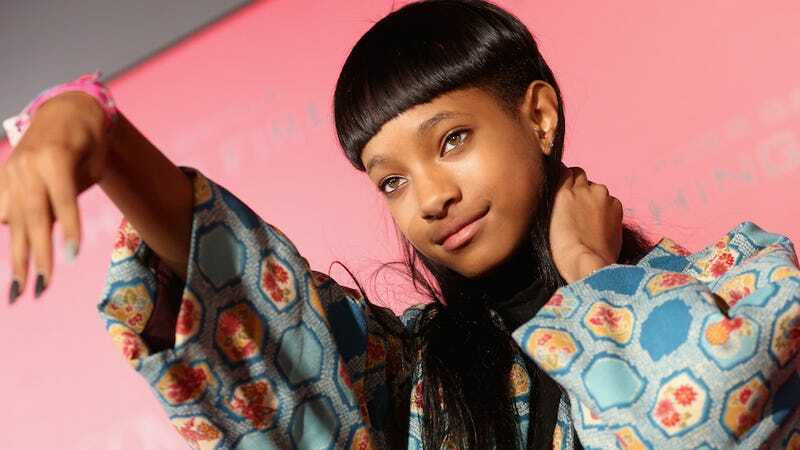 At 14, Willow Smith seems to already know the power that she has, which is the privilege to be strange on her own terms. Listening to her new EP, 3, released Friday, it's clear that instead of existing solely in the noise of pop or R&B, Willow's experimenting in a quieter space. Already, she's done well at expressing a feeling of smallness. It's a short EP, not even 15 minutes long, but here she sounds like a 14-year-old girl dying to understand everything about love. On "9," she sings, "It's tough 'cause I/ Want to love you, but you keep being so afraid/ If only I could stay, if only you could stay." It's easy to get lost in the first two tracks, "8" and "9," which are both soft and lulling. There's more pep in "Flowers," where she sings and quasi-raps the story of Poseidon, "a boy who was enlightened, kinda like Jaden." The vibe of this EP is essentially an extension of the carefree attitude of "Whip My Hair." I'm tempted to roll my eyes at lyrics like this: "Your subconscious is not conscious of poison you're ingesting." But in context, it's part of a larger mystical misfit self-image that she and her brother Jaden have been weaving all over social media. Willow's public existence and determination to explore all versions of herself represent a narrative that we don't see nearly enough—one that moves away from the constraints placed on young black girls regarding their own bodies and their true, full selves. While many have focused on what they deem wrong with the Smiths' parenting choices, perhaps the focus should shift to what it means to have a young black girl in the public eye who exhibits such a strong sense of self, as well as how to nurture that same sense of self in other girls. In conversation, she casually references Drunvalo Melchizedek's The Ancient Secret of the Flower of Life, a New Age-y self-enlightenment guide based on a sacred geometry that's said to hold a wellspring of ancient knowledge. On the one hand, her pursuit of enlightenment is somewhat stereotypical teenage fare, maybe a little pretentious and weird. On the other, it's endearing for a 13-year-old with nearly four million Twitter followers and a Roc Nation record deal being so intent on sharing her curiosity about a better life. Willow's newfound spirituality coincides with a healthy skepticism of authority and an admirable dedication to combat society's "repression of creativity and repression of the naturalist." The reactions to Willow's recent CMJ performance were largely positive. I'm not sure if 3 is indicative of her overall sound, but I will say it's a short and promising preview of her future.